How Will Analytics, AI, Big Data, and Machine Learning Replace Human Interactions? Calls for the death of human intelligence and human interactions are premature. 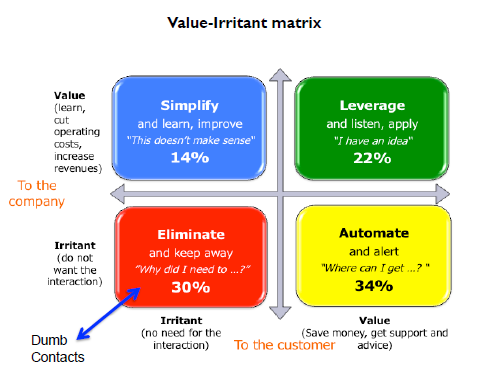 In my first book my co-author and I laid out in a simple 2×2 grid that we called the Value-Irritant matrix how to classify customer contacts into one of four actions: (1) Simplify; (2) Leverage; (3) Eliminate; or (4) Automate1. Turns out that only two of these four actions merit human intelligence and human interactions (Simplify and Leverage), while the other two present opportunities to reduce demand for support (Eliminate, via root cause analysis to remove confusing or mistake-ridden processes or tools, and Automate, via self-service or proactive alerts. Over 9 years since The Best Service is No Service debuted a lot has changed surrounding the need for and ability to provide human interactions, automated solutions, and shape experiences using predictive analytics. In some cases good old human intelligence in human interactions is still needed, and often the best path. However what I am seeing is the ability now to apply that human intelligence to deliver highly impactful automated solutions and predictive models. One big reason for this is the rapid onset of analytics, robotics, AI (artificial intelligence), Big Data, and machine learning to augment, and in some places replace, human intervention. These new solutions have shown to me that the core Principles of Best Service is No Service were spot on, and it has reinforced the need to dig more deeply into data in order to confirm the problem and to determine how to address the problem. Let me share three quick examples, some of them based on “omni-channel” interactions and broad knowledge sharing, both also representing breakthroughs. Chat bots or virtual agents are beginning to gain traction after some early failures that presented robotic or wooden responses vs. robotics and AI. Earlier chat bots and AI couldn’t recognize phrases or accents, and often got stumped with simple words or expressions, just like early speech recognition would play back “I’m sorry, did you say X?” when you said Y. 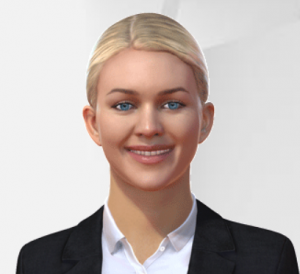 With the newer generation chat bots like Amelia, companies present an immersive and personalized interaction tool with customers, often on their web sites, able to access key data in knowledge management and then, using AI, to tee up the “best-fit” answers to questions (a) that are being asked by customers or (b) should have been asked by them. It’s the 2nd part that brings forward the power of analytics, matching “customers who are like you” and “similar situations” and the string of historical interactions. Using AI in chat bots can not only automate the first contact but also anticipate and reduce the need for the 2nd or 3rd contacts. This has always been a challenge, with lots of guesses and “mother-in-law” research instead of real experiences and data. Now with the power of Big Data companies can, for example, mine the interactions and sales histories between lost customers and current customers to spot similar words or expressions (such as “Your package arrived damaged, again!”), trends (such as reductions in spend rates), and the combination of these words and trends, producing a succinct list of “at risk” customers. Some years ago a leading wireless provider put 2 and 2 together to strike gold using this technique. While the company had provided detailed coverage maps for any address, for example your home or office, they hadn’t thought about providing coverage along routes, such as from your home to your office, until they determined that former customers would often say “Why can’t you keep your network up?” while they were driving. Once they confirmed weaknesses in coverage they notified customers that they might experience dropped calls but that they were adding more towers; in the contact centers they spotted current customers who might have been encountering the same dropped calls en route, so they prompted agents to provide immediate refunds and reassure these subscribers that the network would soon be able to sustain their calls while driving. This example describes how companies can use a robust recommendations engine to try to repair the damage with those at risk customers; if they remain, the system “learns” via machine learning that that recommendation with that customer at that time worked, so it will be tried again (the opposite is also followed, but the recommendation might be offered to in another similar situation to obtain the results and strengthen the learning). As a result, companies can not only keep some of their best customers or best employees but they can also spot missing or confusing processes that help to explain the risks, address those processes, and help hold onto even more customers and employees. In Best Service is No Service and in our second book Your Customer Rules! Delivering the Me2B Experiences that Today’s Customers Demand (Wiley/Jossey-Bass, 2015)4 we proposed using the term “Snowballs” = repeat contacts. Companies that could prevent snowballs from starting, or “melt” them after the 1st attempt, would then produce “Best Service” (preventing them) and enjoy increased customer experience. Today using Big Data analytics companies and isolate which web pages, IVR logic paths, and customer service agents are starting snowballs and which web pages, IVR logic paths, and customer service agents are successfully resolving them, or melting them; these analytics also spotlight which issues or reasons are not resolved the first time and result in snowballs. Digging into the root causes of both of these areas produces improvements in processes that can help to Eliminate many thorny issues. In addition, analytics and machine learning can help to predict that there might be a snowball, and recommend how to address that customer in that moment in order to prevent a repeat contact from happening. As with the predictive models that I described earlier this forms a much stronger engine – either automated or human provided – that in turns delivers a combination of Best Service is No Service and Me2B success. Stay tuned for results from two pilots that I’m leading with Antuit clients aimed at increasing FCR by 10 percentage points in the contact center, and a lot more on the web site. 1. Take stock and score. Since you can’t tell where you are going without a map, the 1st step is to pull together the core issues facing your customers, perhaps along “the customer journey” with “moments of truth” and “pain points”. Add costs and the effects on customer experience and revenues and costs. Toss with a scoring mechanism, either a Likert scale or a 4-level scale (my preference so that there isn’t any opportunity to be “in the middle”) – Be realistic! Here is when you can start to bone up on analytics using books likeCompeting on Analytics5, articles in magazines such as HBR, and of course my CustomerThink columns (and Big Data player Antuit’s web site and cases6). 2. Sort and prioritize. Next up, use the Value-Irritant matrix or some other sorting mechanism to create priorities across the many challenges. This will reveal where you should focus energies to Simplify, Leverage, Eliminate, or Automate customer contacts or issues, and this will lead naturally to determine where to start your analytics program. Continue your education into analytics, digging more deeply into books such as Applied Predictive Analytics7. 3. Test and learn. One of the hot approaches in analytics is “Test and Learn” whereby “the ability the test and learn gives businesses the opportunity to experiment, iterate and grow skills and competences throughout the organization (sic, English article! )” It’s really hard to figure out before you start which actions or paths will work, so applying human intelligence in this stepwise testing and learning will winnow the possibilities quickly as it also produces tangible learnings. Read up on the many test and learn summaries on the Internet 8. 4. Rinse and repeat. Analytics is always iterative. In a recent client project we topped out at 70 distinct iterations of more than 50 data sources housed in 8 repositories – a good example of the mash-up power in Big Data. There really isn’t any “there” in analytics since customer demands and requirements will continually evolve, driven by “best practice” often outside of the company’s direct competitors; since analytics tools in compute, data, and science (see my earlier CustomerThink column “3 Tips for Customer Experience Analytics“9); and since the ability to apply new approaches such as machine learning will be available. Go for it! Your customers, employees, business partners, and shareholders will thank you as you increase revenues, reduce costs, and keep your customer happier! 4 Your Customer Rules! Delivering the Me2B Experiences That Today’s Customers Demand (Wiley 2015). Here are the 7 Customer Needs that Lead to a Winning “Me2B”Culture; each Need breaks down into a total of 39 Sub-Needs. 6 See http://www.antuit.com, accessed 11 June 2017. Thanks for sharing the matrix, Bill. It’s very helpful to think about not only the customer support but the overall engagement and marketing function through this lens. Is there a high resolution version of the graphic others might share with source detail? Thanks for sharing such useful information Bill, actually human intelligence is replaced by big data and analytics. Gonna try out your recommendations.